NASA’s Dawn spacecraft is on a mission to explore the two largest objects in the asteroid belt the asteroid Vesta and the dwarf planet Ceres, gathering data relating to their composition, internal structure, density and shape. The main objectives of the mission are to gather data to aid further understanding of the role that size and water content plays in planetary evolution and also the processes and conditions present at the solar system’s initial period. Launched in September 2007, Dawn entered the orbit of Vesta in July 2011 and spent 16 months there before leaving for Ceres. 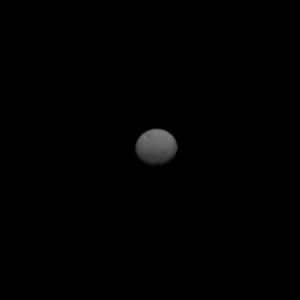 It entered Ceres orbit on March 6, 2015. Dawn was finally launched on on the 9th of September 2007 from Cape Canaveral, Florida. The mission had previously been cancelled twice, put in “stand down” mode once and “indefinitely postponed” once. 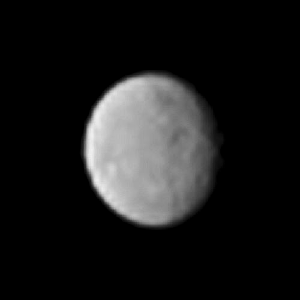 Dawn reached Vesta on 16 July 2011 and went into orbit. The four year heliocentric cruise took Dawn to within 542 km from the surface of Mars. Dawn departed Vesta on September 5th 2012 and reached Ceres on March 6th 2015. 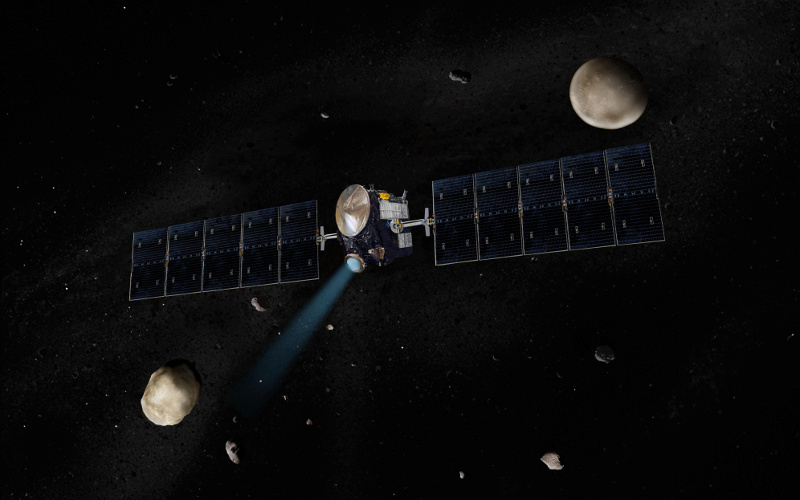 Dawn achieved two significant milestones; being the first spacecraft to visit a dwarf planet and to also orbit two extraterrestrial bodies. Dawn’s scientific objectives are to gather and return data that will help to characterize the asteroids’ dimensions and mass, internal structure, density and composition, surface morphology, cratering, and magnetism. Data containing full surface imagery and spectrometric mapping, topographic profiles, gravity fields, elemental abundances, and mapping of remnant magnetism will be transmitted back to earth. This data will help scientists to understand the thermal history and role of water in the evolution of asteroids and possibly establish if meteorites found on Earth come from these bodies. The Dawn mission is part of the NASA Discovery Program. The Dawn spacecraft is made of aluminium and graphite composite, it has a dry mass of 747.1 kg and a mass of 1217.7 kg when fully fuelled prior to launch. The spacecraft is a box-shaped design measuring 1.64m x 1.27m x 1.77m. The core of the spacecraft is a graphite composite cylinder, with xenon and titanium hydrazine tanks mounted inside. Access panels are constructed from an aluminium core with aluminium face sheets. Dawn uses an ion propulsion system consisting of three ion thrusters, the design originates from the Deep Space 1 spacecraft ion drive, this principle uses xenon which is ionized and accelerated by electrodes. The 30-cm diameter two-axis gimbal mounted thrusters distribute the xenon ion engines maximum thrust at 2.6 kW input power of 92 mN, the engines are capable of a specific impulse of 3200 to 1900 s. Only a few spacecraft before have used this system. Dawn’s solar panel array measures 19.7 metres from tip to tip when fully extended. The spacecraft’s two 2.3 x 8.3 meter solar panels are composed of InGaP/InGaAs/Ge triple-junction cells which provide 10.3 kW at 1 AU (1.3 kW at end-of-life at 3 AU). This solar generated energy is used to power the spacecraft’s electronic components, which require between 22-35 V, and the electric ion propulsion system which requires 80-140 V. The power generated is stored in a 35 Ah NiH2 battery. 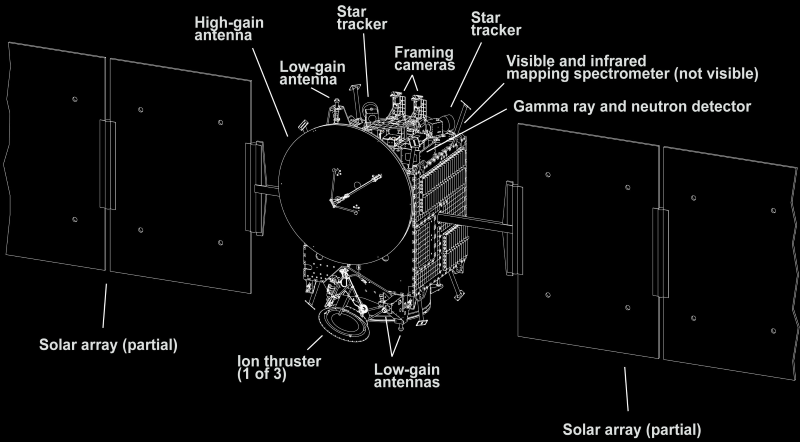 Dawn is equipped with a state of the art science payload incorporating: Framing Camera (FC), Visible & Infrared Spectrometer (VIS), Gamma Ray and Neutron Detector (GRaND) along with a memory chip containing the names of 360,000 space enthusiasts, a laser altimeter and star trackers. X-band communications are used for uplink (7.8 b/s – 2.0 kb/s) and downlink (10 b/s – 124 kb/s) transmissions. A RAD6000 processor, 8 Gb mass memory and a Mil-Std-1553B data bus deals with all the data handling operations. The xenon tank, holds 425 kg of propellant at launch. The hydrazine tank, holds 45.6 kg of propellant at launch. The twelve hydrazine thrusters maintain attitude control and can also be used when completing orbit insertion manoeuvres. Cool Space Facts A collection of cool facts about the Sun and all the planets in our solar system (sorry Pluto).